Do you enjoy a life on the ocean wave? If so, this box may be for you! 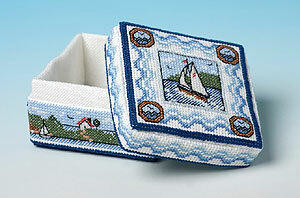 It stands 4.25 cms high and 7cms square and is embroidered with sea side scenes. Kit contains 16-count aida, lining fabric, stranded thread, wadding, plastic canvas pieces, needle, chart and full instructions.